Iranian President Hassan Rouhani suffered in the run-up to crucial elections in early 2016 what amounted to at least a symbolic defeat when state-run television banned Iran’s most popular soccer program from running an interview with his foreign minister, Mohammad Javad Zarif, on soccer and politics. Amid confusion about the reason for the ban, Iranians worried that not only was their beloved, already highly politicized sport being dragged further into the country’s power struggle but also that government-controlled television was taking sides in a partisan struggle. Iranian media reported that Islamic Republic of Iran Broadcasting (IRIB), the country’s broadcast authority, had banned Mr. Zarif’s appearance because of his liberal views and the fact that his appearance on the soccer show might brand him as a leader in the mould of nationalist president Mohammed Mossadegh, who was toppled in 1953 in a US and British-backed coup. “Iran's soccer diplomacy: ‘anything goes’ in fight for parliament seats,” said one headline referring to polling in February to elect both the Islamic republic’s legislature as well as its Assembly of Experts, the forum that appoints the country’s spiritual leader. The assembly, which is elected for a period of eight years, could well be the first in 26 years to appoint a new spiritual and political leader with 76-year old Ayatollah Ali Hosseini Khamenei believed to be suffering from prostate cancer. He said Iran was “getting ready for determining its fate for years to come" with February’s elections for parliament and the assembly. Mr. Khamenei has rejected attempts in recent months by Rouhani to limit the assembly’s ability to bar moderates from standing as candidates. Efforts by hardliners with the Islamic Revolutionary Guards Corps (IRGC) in the lead to control soccer underline the importance of the pitch as a battleground in the struggle for Iran’s future in the wake of the nuclear agreement with Iran and the expected lifting of stringent United Nations sanctions that Western nations hope will boost Mr. Rouhani in the elections. The significance of soccer has been heightened by Iran’s poor international performance as well as allegations of match-fixing scandals that have forced the guard to justify its involvement in the sport. In a recent interview with sports magazine Tamashagaran Emrooz (Today's Spectators), Guards commander Azizallah Mohammedi, a former board member of the Football Federation of the Islamic Republic of Iran (FFIRI) argued that the military group’s involvement in soccer had grown from the fact that some of its members had played soccer in the past. He said they had become soccer managers not as part of a Guards strategy but because of the qualifications and skills they brought to the table. Mohammed Dadkan, who served as FFIRI president from 2002 to 2006, however dismissed Mr. Mohammedi’s portrayal in an interview in August. “Managers in the world of football world are corrupt. Unfortunately, people who know nothing about football are involved in this sport - managers from the Guards and the Law Enforcement Forces," Mr. Dadkan said. IGRC commanders have served at various times as head of Persepolis FC, one of Iran and Asia’s top clubs while Lotfollah Forouzandeh Dehkordi, a guard commander and former vice-president under Rouhani’s hard-line predecessor, Mahmoud Ahmadinejad, is a member of its board. Fajr Sepasi FC, a club in Shiraz owned by The Organization for Mobilization of the Oppressed or Basij, a voluntary militia associated with the guards, is directed by Colonel Zohrab Qanbari Mahardou. Brigadier-General Gholam-Asgar Karimian is chairman of Tractor Sazi FC, a top flight club in Tabriz, the capital of East Azerbaijan, whose supporters have protested in recent years against the government’s environmental policy and at times raised Azeri nationalist slogans. The club’s president is former Guard Saeed Abbassi while another commander, Mostafa Ajorlou, the guards’ former head of physical training, is a member of its board. Traktor Sazi is owned for 70 percent by the city’s state-owned tractor company, which in turn is owned by Mehr-e Eqtesad-e Iranian Investment Company that was sanctioned by the US Treasury as a subsidiary of Mehr Bank, an IGRC financial institution. The remain 30 percent by the Defence Ministry’s by Kosar Financial Institution. Mr. Ajorlou, wh en he headed Steel Azin FC before joining the Traktor Sazi board, tried to sack top Iranian player Ali Karimi for allegedly not fasting during Ramadan and questioning the commander’s decisions. The letter said the groups were campaigning for a “study the mother tongue day.” It suggested that the mother tongue referred to was Talysh, a dying northwest Iranian language that is still spoken by at most a million people in the Iranian provinces of Gilan and Ardabil and the southern Azerbaijan. The letter implied that the groups General Karimian was concerned about were Azeris separatists, Islamists and Turkish Alevis, a sect viewed as heretical by orthodox Islam that accounts for up to 20 percent of Turkey’s populations. If anything, the letter’s focus appeared to advocate measures to weaken Azeri separatist groups by combatting widespread racist attitudes towards Azeris and improving services in East Azerbaijan. Racial attitudes towards Azeris is something Traktor Sazi knows a lot about. As a result, stadia in which Traktor Sazi Tabriz FC play are repeatedly the venue for protests demanding greater rights for Iran’s Azeri minority. During one clash in 2013 in Teheran’s Azadi stadium with the capital’s storied Persepolis FC, Traktor Sazi supporters unfurled a banner saying in English: “South Azerbaijan isn’t Iran,” a reference to East Azerbaijan that borders on Azerbaijan. Implementation of these demands would not challenge the fundament’s of Qatar’s family rule political structure compared to other ITUC demands such as the trade unions’ insistence on worker representation through elected representatives and the right to collective bargaining. The ITUC, however, stopped short in its report of demanding abolition of kafala or the formation of independent trade unions. The ITUC report put foreign companies involved in the construction in Qatari projects, including ones related to the World Cup, on the spot by accusing them of exploiting underpaid workers that they in the trade unions’ words use as "modern-day slaves.” The report asserted that workers building the Khalifa International Stadium were earning $1.50 an hour. The report estimated that “$15 billion profit will be made by companies working in Qatar on infrastructure… Every CEO operating in Qatar is aware that their profits are driven by appallingly low wage levels -- wages that are often based on a system of racial discrimination -- and that these profits risk safety, resulting in indefensible workplace injuries, illnesses and deaths," the report quoted ITUC general secretary Sharan Burrow as saying. 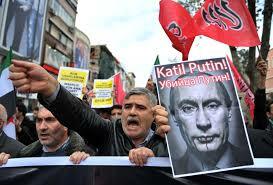 "The Turks and Russians who will fill the stadiums here and in Russia are not adversaries, and still less enemies. If the match is played in a gentlemanly spirit and helps reduce the tensions between the countries, then something positive will come from a draw that could seem negative," Mr. Davutoglu told A-Haber TV. The Lokomotiv-Fenerbahce clash could prove to be the first of more confrontations on European pitches if both Turkey and Russia progress in qualifiers for Euro 2016. "We already hit them in the air and now on the turf -- wait for us, Lokomotiv Moscow," said Turkish soccer fan Huseyin Uysal on Twitter. Russian Sports Minister Vitaly Mutko said that any future World Cup-related contracts would not be awarded to Turkish construction companies but that existing commitments would not be affected. "They won't be here in the future but at the moment they have contracts and these will not be looked into," Mr. Mutko said. In rare Russian praise for Turkey since the downing of the jet, Mr. Mutko appeared to be making an about face by stating that "The Turkish side is capable of providing security and there were never any problems in this regard. If they were unable to host tournaments of such level, the international organizations would have never given them the rights to do it," Mr. Mutko said. FIFA has suggested that Russian soccer could be violating the world body’s rules and regulations if it decisions proved to be politically influenced. "FIFA will monitor the situation and any potential issues on a case-by-case basis, should there be any appearance of a breach of FIFA statutes or regulations,” a FIFA spokesperson said. Ridden by the worst corruption scandal in its history, world soccer body FIFA is breaking new ground by seeking to put United Nations guidelines for human rights at the centre of its activities. If fully implemented, the move would not only set a precedent for other international sports associations but could also have far-reaching consequences for FIFA’s future selection of World Cup hosts, current tournament hosts Russia and Qatar, and the eligibility of various members of the executive boards of the group and its regional soccer federations. The move would also put centre stage the relationship between politics and sports in general and soccer in particular. With human rights inextricably linked to politics, the initiative makes it more difficult, if not impossible, for FIFA to maintain its position that sports and politics are separate. Denial of the incestuous relationship between the two has allowed FIFA and other international sports associations to enable autocracies and violators of human rights to use the World Cup and other tournaments to launder their reputations, distract attention from alleged abuse and suppression of human rights and basic freedoms, and project themselves favourably on the international stage. The proof of FIFA’s sincerity in becoming the first international sports federation to make human rights an integral part of its processes, procedures and decisions will lie in how it applies the principles. FIFA’s decision to seek external help in adopting human rights principles as part of its DNA is remarkable given the group’s past support for autocracies and flouting of moral and ethical standards. FIFA moreover has an abysmal track record in following external advice it commissioned on how best to reform the deeply troubled organization. FIFA’s sincerity is likely to be put to the test from the day the UN principles are formally adopted with the hosts of both the 2018 and 2022 World Cups, Russia and Qatar, accused of systematic violations of human rights, and some members of the executive committees of the group as well as of regional soccer confederations facing unanswered questions about their own human rights record or that of the organizations they represent. Much will depend on a report FIFA commissioned by Harvard international affairs and human rights professor John Ruggie, a former UN Secretary-General special representative for business and human rights. Mr. Ruggie is scheduled to deliver his report in March on how FIFA can best embed the UN’s Guiding Principles on Business and Human Rights in everything it does. Mr. Ruggie’s report is due just after FIFA’s extraordinary congress in February that is set to elect a new president to succeed Sepp Blatter, who after 40 years with the group, 17 of which he served at the helm, has been suspended on suspicion of corruption. Scores of FIFA and other soccer executives have been indicted on corruption charges in the United States while Switzerland is looking into the integrity of the awarding of the Russia and Qatar World Cups. US Attorney General Loretta Lynch said earlier this month that she hoped that Qatar would cooperate with her department’s ongoing investigation that has so far focussed on wrongdoing in the Americas. The investigations focus on financial transgressions rather than political corruption, which is harder to tackle in legal terms without a structure that governs the relationship between politics and sports. Under the guidelines that would change with FIFA having to take a far more forceful stand on issues like labour rights in Qatar and gay rights in Russia as well as having to take a more detailed look at human rights allegations against Bahraini FIFA executive committee member and Asian Football Confederation chief Sheikh Salman bin Ebrahim Al Khalifa, a frontrunner in the world body’s presidential election – all issues that are political in nature and tied to the politics of the various countries. 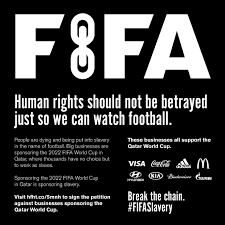 FIFA has so far been wishy washy in its criticism of Qatar’s kafala or sponsorship system that puts employees at the mercy of their employers. Significantly improved labour standards adopted by several Qatari institutions, including the 2022 Supreme Committee for Delivery & Legacy, have yet to be enshrined in national legislation and stop short of giving migrant workers, who constitute the majority of the Qatari population, full basic rights. FIFA for example failed to follow the advice of Theo Zwanziger, a former German soccer executive, who was responsible for monitoring Qatari progress on labour reform before surrendering his FIFA executive committee seat in May, that Qatar be held to deadlines. Mr. Zwanziger had called for sanctioning of Qatar if it failed to establish by May an independent commission that would oversee labour reform. A report commissioned by Qatar by British-based law firm DLA Piper had proposed the oversight mechanism. Qatar has yet to act on the advice. FIFA has shied away from passing judgement on Mr. Salman, who has denied allegations based on extensive reporting by the state-owned Bahrain News Agency (BNA) that serves exclusively as a channel for official government pronouncements that he was involved in the identification of some 200 athletes and sports executives who were penalized for their alleged participation in a popular uprising in 2011. Some of the athletes, including two national soccer team players, were tortured at the time. Mr. Salman, who was the then head of the Bahrain Football Association (BFA), has never denied the abuse nor condemned it. In his most explicit statement to date, Mr. Salman recently denied any involvement, saying that the committee to identify the athletes and executives he was said by BNA to have headed had never been established. Similarly, the players who spoke about their abuse four years ago and have since remained silent recently denied their earlier statements in interviews organized by Mr. Salman’s presidential campaign. FIFA has opened the door to making history with its commissioning of Mr. Ruggie and expected adoption of the UN guidelines. It will be up to the group to set the example by not only applying the principles to future decisions and initiatives but also by applying them to major current issues. The guidelines, according to Mr. Ruggie, would oblige FIFA to “apply maximum leverage” to address existing human rights issues and “to withdraw from contracts” if its efforts fail. With a deficit of $100 million as a result of the corruption scandal, “FIFA is killing the golden goose. They are realizing that,” Mr. Ruggie said in an expression of hope that FIFA would act on his advice on how to apply the UN human rights principles. Al Ahli’s Ultras Ahlawy and Zamalek’s Ultras White Knights issued their statement after the two groups attended a handball match without incident. "Today, at Ahi's Abdullah bin Faisal court, fans decided to teach (authorities) an effective lesson. Everyone witnessed the presence of the largest sets of fans with few metres separating them and not a single problem occurred although there wasn't any security," the two groups said on Facebook. The fans insisted in their statement that they were capable of handling security themselves. “Every time the fans take responsibility of their own safety, things pass very smoothly… The fans trust themselves and their ability to organize themselves. It's not our fault that some parties are not able to carry out their duties," they said in a snide at security forces and the interior ministry. As the threat from Islamic State (also known as IS or ISIS or by its Arabic acronym of Daesh) continued to grow, US-led coalition forces intensified their aerial attacks on IS militants and strategic installations in Syria and Iraq, in a concerted effort to destroy and degrade the self-styled caliphate. However, far from caving in, IS has expanded its territorial reach by moving across the Mediterranean Sea into Libya's coastal region, the Sahel and West Africa. Some scholars argue that the ability of IS to attract foreign fighters as well as idealistic Muslims from across the globe willing to become cannon fodder in suicide missions at home, make it a lethal force and very dangerous to any government willing to confront it. These analysts say that the militants' ideology has been fuelled by the austere and puritanical interpretation of Islam by Saudi Arabia, a country which has significantly advanced Salafi-Wahhabi beliefs (a return to Islam as espoused by the first three generations of Muslims who are collectively known as the salaf). German Vice-Chancellor Sigmar Gabriel, in a rare attack by a Western official, accused Saudi Arabia recently of financing extremist mosques and communities in the West that constitute a security risk and warned that it must stop. “We have to make clear to the Saudis that the time of looking away is over,” Gabriel said in a German newspaper interview. “Wahhabi mosques all over the world are financed by Saudi Arabia. Many Islamists who are a threat to public safety come from these communities in Germany,” he said. Algerian author and columnist Kamal Daoud wrote in The New York Times recently that the penchant of IS for beheading, killing, stoning, and amputating victims; and despising women and non-Muslims, mirrors the practice of Saudi Arabia. “The kingdom relied on an alliance with a religious clergy that produces, legitimises, spreads, preaches and defends Wahhabism, the ultra-puritanical form of Islam that Daesh feeds on," Daoud declared. The difference was that Saudi Arabia, governed by a labyrinthine ruling family-religious complex, was less crude in the way it presented itself to the global community. Daoud asserted that Saudi Arabia was what IS rule could look like once it had settled in and discarded its jihadist and expansionist tendencies. Mainstream Muslim scholars, including those in Southeast Asia, have long warned that Wahhabism threatens other versions of Islam in countries where the Muslims are either a majority or a minority. British author and former intelligence officer Alastair Crooke believes that IS has undermined the legitimacy of the Saudi ruling family by returning to the rigours of the 18th century alliance between the founding fathers of modern Saudi Arabia and the fundamentalist Sunni preacher Sheikh Muhammad Ibn Abdul Wahhab who rejected as innovation everything that had been introduced after the salaf. To be sure, IS in its present reiteration, was not created by Saudi Arabia; it was forged in the wake of the US toppling of Saddam Hussein in 2003 by among others the disbandment of Saddam Hussein's army, whose senior officers were mostly Sunnis who already had Islamist networks; the insurgency and civil war between Iraqi Shias and Sunnis that continues to this day; and the morphing of Al-Qaeda in Iraq into ISIS, which was in turn energised by civil strife in Syria and evolved into IS. These militant groups expanded and consolidated under the umbrella of IS, culminating in the singular act of declaring a caliphate that covers Iraq and the Levant (which includes Israel, Jordan, Lebanon, Palestine and Syria). IS challenges Saudi Arabia for the allegiance of Sunnis across the Middle East. The group’s ultimate objective is to set up the first major caliphate since the demise of the last caliph with the breaking up of the Ottoman Empire by Western imperial powers in the wake of the First World War. IS strives to spread Salafi-Islamic rule across the globe. Conscious of the enormous political and strategic fallout from IS’ affinity with Saudi Arabia’s religious, social and moral system as well as other forms of association with IS (such as the use of Saudi secondary school books in Mosul, Iraq, after its capture by IS in 2014), the Saudi government has come to view the militants as a threat. 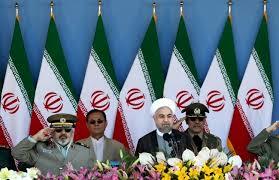 It has over the years condemned militants led by Al-Qaeda chief Osama bin Laden and IS leader Abu Bakr al Baghdadi. In response to the November 2015 bloody rampage in Paris, the Saudi rulers have called on the international community to "eradicate this (referring to IS) dangerous and destructive plague". Saudi Arabia clearly does not want the world to identify the kingdom’s puritan interpretation of Islam with IS and jihadism despite the fact that it has served as a breeding ground for ever more virulent strands of the faith. That said, it was King Faisal bin Abdul Aziz Al-Saud, whose mother was a descendant of Abdul Wahhab, who advocated modernity in the conservative kingdom while at the same time launching Wahhabism’s global proselytisation campaign on the back of the huge cash revenues earned in the wake of the 1973 oil embargo that sent oil prices skyrocketing. Some reasoned that Faisal's campaign was initially payback for the support of the ulama (religious scholars) in a protracted power struggle with his brother, King Saud that ultimately secured him the throne. British author and religious scholar Karen Armstrong suggests that IS may have over-reached itself with its unsustainable policies and jihadist philosophy. A majority of Sunnis and Shias reject what IS stands for. Armstrong notes that Saudi Arabia, with its impressive counter-terrorist resources, has already thwarted IS attacks in the kingdom. Saudi Arabia and other Gulf states nonetheless have made clear that dealing with IS does not top their priorities. The kingdom and its Gulf allies, bogged down in an intractable war in Yemen viewed by the Saudis as a proxy war against Iran, have effectively withdrawn militarily from the US-led campaign against IS. The key to removing the challenge from IS has to be the realisation that the terror group’s appeal is not its alleged goal of an atavistic return to the glorious past of Islam, as Armstrong put it. Nor is Islam at the core of its multiple conflicts. The current appeal of IS is the opportunity it offers the socially, economically and ethnically disenfranchised to revolt and its ability with the help of technological advances to take the battle to historically new levels. Military defeat of IS will not soothe the anger of the disenfranchised. Addressing their concerns will. James M. Dorsey is a senior fellow at the S. Rajaratnam School of International Studies, co-director of the University of Wuerzburg’s Institute for Fan Culture, a syndicated columnist, and the author of The Turbulent World of Middle East Soccer blog and a forthcoming book with the same title. Mushahid Ali is a Senior Fellow in RSIS. A $400 million sale by a senior member of the UAE ruling family of a 13 percent stake in Manchester City FC to China Media Capital (CMC), a subsidiary of China Media Group Corporation (CMG), a state-backed investment conglomerate, highlights the importance of soccer in the two countries’ ambitions to project themselves on the international stage. The sale, which values Manchester City at $3 billion, puts to bed any suggestion that Sheikh Mansour bin Zayed al Nahayan’s original $400 million acquisition in 2008 of the then troubled English club was an act of vanity. It further underscores the UAE’s development from what Bloomberg news called the Switzerland of the Gulf to its military and diplomatic Sparta. The sale is part of a bid to employ the UAE’s financial muscle to project the Gulf state despite its small population and loose federal structure as a major military, political and diplomatic power capable of marshalling its armed forces, foreign service and ruling family to shape politics and policies far beyond its borders. The sale also signals UAE intentions to further expand into China and cement relations with a global behemoth. The deal puts into perspective Manchester City’s earlier decision to appoint its former player, Sun Jihai, as its ambassador to China and to include him in the hall of fame at Manchester’s National Football Museum, a move that initially raised eyebrows in the British soccer community. China last year stressed the importance it attributes to soccer domestically as well as internationally with the unveiling of a 50-point plan to turn the country into a football giant. In a first step, Guangzhou Evergrande Taobao FC won the Asian Football Championship. The plan made soccer a mandatory part of China’s school curriculum, pledged to establish 50,000 soccer schools and multiple academies over the next decade, and to set up a soccer lottery that would help fund the sport’s development. The plan also envisions professionalization of the Chinese Football Association (CFA), by separating it from China’s ports bureaucracy but not from Chinese politics. Taiwanese soccer scholar Tien-Chin Tan argues that Chinese leaders see their country’s poor soccer performance as a “slap in its leader’s face” against the backdrop on China being a top scorer in Olympic competitions. The Chinese emphasis on soccer, alongside the hosting of mega events like various Olympic games, further reflects President Xi Jinping’s personal passion first expressed in 2011 during a meeting with South Korean officials even before he became his country’s leader. Mr. Xi said that his three personal ambition were for China to qualify for the World Cup, host the event and, ultimately win it. The Manchester City deal follows the adding of Le Sports, a subsidiary of China’s largest online video company, LeTV, to the list of Dutch club AFC Ajax’s Chinese sponsors, which includes Huawei, Sengled, and CST. The agreement calls for the establishment of an Ajax training camp in China. The sale has significant economic benefits, including opening up to the UAE what is likely to become the world’s foremost soccer market involving opportunities to market its Manchester City and other brands in China, capitalize on opportunities arising from the country’s soccer development plan, and the English Premier League’s increasing popularity in China. The degree to which soccer allows the UAE, which packages its repression of dissent at home and fierce opposition to any expression of political Islam that translates into pressuring other countries into adopting its hard line views, to exert leverage and project itself as a force of enlightenment is obvious in public statements by its representatives as well as media reports on its diplomatic moves. 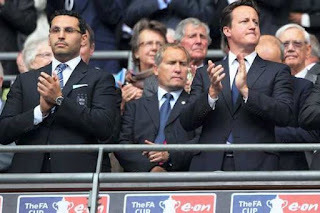 The Guardian reported last month that Manchester City chairman Khaldoon Al-Mubarak, a close business associate of UAE Crown Prince Mohammed bin Zayed bin Sultan Al Nahyan, had warned the UK that his country would block multi-billion dollar arms deals, halt investment in Britain and suspend intelligence cooperation if Prime Minister David Cameron failed to crack down on the Muslim Brotherhood. We know that to win, we must not only defeat what we are against, but we must also define what we as Muslims and Arabs are for,” Mr. Al Otaiba added. In many respects, the UAE’s social and economic achievements as well as the projection of its military prowess in countries like Yemen and Libya is beyond doubt. Nonetheless, the UAE’s achievements are also geared to cementing autocratic family rule. Soccer with Manchester City in the lead, alongside high expenditure on public relations, has allowed the ambitious Gulf state to project itself as a modern, enlightened state rather than a repressive, autocratic regime that understands that economic and social development coupled with the ability to punch internationally above its weight is key to the survival of its regime. The sale to China of a stake in Manchester City strengthens the UAE’s strategy and adds an arrow to its quiver. It aligns the UAE’s global ambitions with those of China and strengthens perceptions of the UAE as a global player. This should be a time of celebration for Mohamed bin Hammam, the man who achieved the impossible and brought the World Cup to Qatar. His beloved Al Rayyan football team have just set a Qatar Stars League record by winning their first 10 games of the season to dominate the standings. And on Wednesday, five years will have passed since his spectacular achievement in persuading FIFA to award sport’s most watched event for the tiny desert Gulf state in one of the most controversial votes in sporting history. But the 66-year-old tycoon has become Qatar’s invisible man — tainted by the scandal that has engulfed world football. Since his spectacular fall began in 2011, when his decision to challenge Sepp Blatter for the FIFA presidency led to him being banned for life from football, bin Hammam has become a symbol of the corruption crisis which has rocked the world body. Although he did not play an official role in Qatar’s bid, bin Hammam stands accused — though not proven — of helping to secure the World Cup through payments to officials, including more than $1.5 million to Caribbean powerbroker Jack Warner. Britain’s Sunday Times newspaper alleged that the Qatari entrepreneur made secret payments ahead of the 2010 vote for the World Cup and, later to buy votes during his disastrous presidential campaign. From being at the very centre of world football, including as head of the Asian Football Confederation, by the end of 2012 bin Hammam had disappeared without trace. But his presence still casts a shadow over world football. Earlier this month, Swiss investigators examining how Qatar won the race for 2022, said they would “particularly welcome” a statement from bin Hammam. There was no public response. Bin Hammam would like to talk, it is said, but he has been advised not to give his side of the story, at least not yet, according to sports officials in the region. Despite the silence, bin Hammam’s presence is felt. “It’s not that he’s been outcast, it’s just that it is in nobody’s interest that he is seen to be in contact with them,” James M. Dorsey, an academic and writer who follows Middle East football, told AFP. It is believed however that bin Hammam retains the support of former colleagues within the football administration world, who remain on speaking terms with him. Although he is no longer thought to travel outside Qatar, bin Hammam regularly attends Al Rayyan matches, though missed their record-breaking win at the weekend, and is still a successful businessman. As well as being a football administrator, he is said to be genuinely passionate about the sport. Bin Hammam — who was born in the year Qatar first exported oil — remains in the construction industry in which made his fortune. He heads a construction business with some 2,000 employees and friends say he inspires great loyalty among those who work for him. “Qatar will not hand him over (to investigators),” added Dorsey, acknowledging the debt many still feel is owed bin Hammam within the Gulf. In Qatar, many still view him as a man who achieved the impossible and, like the country itself, has been unfairly tarnished in the fallout. There is talk of his generosity and his gesture in meeting the medical costs for one employee who suffered a heart attack. Other Qataris and officials in the region talk of his modesty, calm and even shyness. Bin Hammam may have to overcome that last trait though, as he may well be forced centre stage again during the investigations into 2022, by Switzerland’s Attorney General and US federal prosecutors. Qatar’s position on the investigations is that they have always cooperated fully, while denying any charges of corruption. But any request from investigators for evidence from bin Hammam could test Qatar’s resolve. “There’s obviously no interest in making more of a scapegoat than he already is, but circumstances can change,” added Dorsey. Words but no actions. 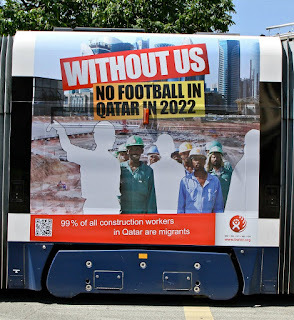 That is Amnesty International’s evaluation of promised Qatari labour reforms on the fifth year of the awarding of the 2022 World Cup hosting rights to the Gulf state. Qatar’s failure to enact wide-ranging reforms heightens the risk of its hosting rights being called into question against a backdrop of legal investigations into the integrity of its bid and world soccer body FIFA presidential elections that could spur increased pressure on the Gulf state in FIFA’s bid to put a massive corruption scandal that involves Qatar behind it. Mr. Qadri noted further that FIFA had “played its part in this sorry performance” given that it was aware of the labour issues when it awarded the World Cup to FIFA. He said FIFA needed to work with Qatar and business to address the issue. Prince Ali Bin Al Hussein, a frontrunner in next February’s presidential election, has warned that FIFA could revisit Qatar’s hosting rights if it failed to follow through on promises to improve the living and working conditions of migrant workers working on World Cup-related construction sites. He said human and workers’ rights were important criteria in the awarding of the tournament, which together with the Olympic Games is the world’s foremost sporting mega event. “As an Asian, I am asking that they (Qatar) have to abide by that. I have seen suggestions from Qatar especially in terms of workers’ rights that they want to move ahead but FIFA has to guarantee that they do so. Because that is the basis of how we should be. Football can be a right conduit to serve the society and that for me is the most important thing,” Prince Ali said. FIFA’s corruption scandal has so far led to the indictment in the United States of 14 serving and former FIFA executives as well as suspension of the group’s president, Sepp Blatter, and European soccer chief Michel Platini. It has also sparked a Swiss investigation into the awarding in December 2010 of the tournament to Qatar and the 2018 World Cup to Russia. The US Department of Justice proceedings could be expanded to include the Qatari bid, which has been tarred by allegations of corruption and bribery. Qatar initially built goodwill by responding positively to criticism by trade union and human rights activists who described its regime for migrant worker force that constitutes a majority of the Gulf state’s population as ‘modern slavery.’ Qatar’s kafala or sponsorship regime puts employees at the mercy of their employers. The goodwill has since largely been wasted by Qatar failing to forcefully follow through on promised reforms. In a first positive fallout from the awarding of the tournament, Qatar broke with the Gulf practice of barring entry to the country or imprisoning its critics. Instead, it opened its doors to the likes of Amnesty, Human Rights Watch and the International Trade Union Confederation (ITUC). 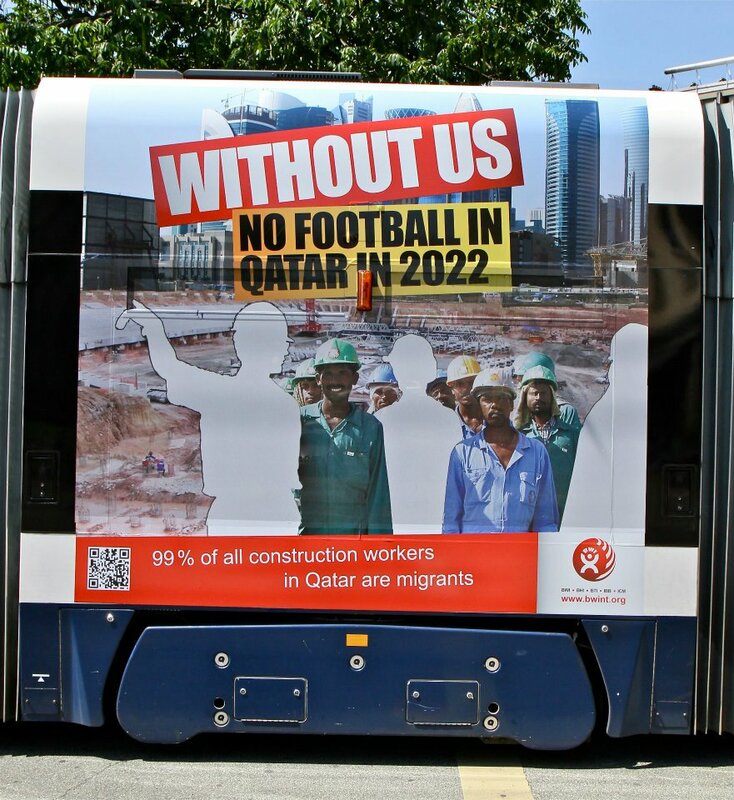 As a result, the 2022 Supreme Committee for Delivery& Legacy alongside Qatar Foundation and Qatar Rail adopted labour standards applicable for all their contracts that significantly improved workers’ living and working conditions but stopped short of abolishing the kafala system. That may help to assuage FIFA’s next president but will not convince Qatar’s critics who argue that the standards need to be enshrined in national law rather than only applicable to a limited number of Qatari institutions. It raises questions about Qatari sincerity and the value of engagement. In its statement, Amnesty noted that Qatar has backtracked on promises to implement limit changes by the end of this year. Among other things, Qatar has postponed until the end of next year expanding its labour inspector force as well as limited changes of the kafala system. The changes moreover fail to abolish one of the most onerous facets of kafala, the need for an employee to obtain his or her employer’s consent to change jobs. A series of related events have called into question the effectivity or the sustainability of the kafala system and cast a further shadow over how Qataris, who constitute a minority of the Gulf state’s population, approach communal affairs. Qatar last month introduced a long delayed wage protection system that requires businesses to pay workers on time by direct bank deposits. Yet, several hundred employees of Drake & Scull in a rare work stoppage that is banned in Qatar went on strike last week in a dispute over unpaid wages. Moreover, heavy rains that last month led to flooding, including of Qatar’s newly opened $15 billion Hamad International Airport, prompted an investigation into the quality of construction and a temporary ban on contractors and workers leaving the country. Qatar appeared to be underlining de facto segregation in a move that cast a further shadow over its sincerity about labour reform with Doha’s Central Municipal Council set to vote on barring single men from entering malls on at least one day a week. 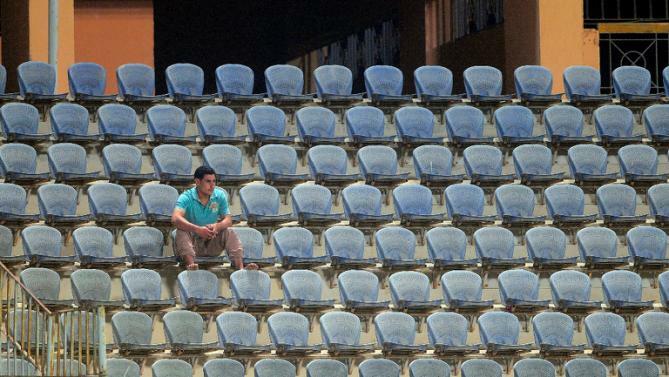 Most of Qatar’s migrant workers arrive leaving their families behind in their home countries. Under the proposal, they would be unable to visit malls on the one day a week that they are off. Malls are alongside sports facilities Qatar’s main venue for public relaxation and entertainment. In another facet of de facto segregation, those facilities are off limits to migrant workers. Qatari institutions that have adopted improved standards like the supreme committee are building separate sports facilities for workers in cities that are exclusively built for them. "This looks like discrimination by stealth. It will certainly have a detrimental effect," warned Human Rights Watch Gulf researcher Nicholas McGeehan. 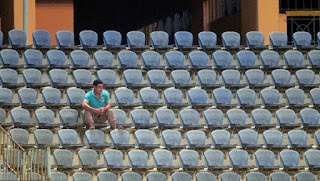 While Qatar’s national soccer team has recently performed well and invested heavily in grooming potential foreign players, Guardian reporter Robert Booth noted recently that the Gulf state has ignored a potentially significant talent pool in its own backyard: soccer-crazy migrant workers. Qatar “should scout the migrant camps for football stars, make the best of these citizens and throw them into national sides. It would be a statement of intent,” Mr. Booth said. The politics of its citizenry being a majority in its own country is what complicates labour reform that many Qatar’s fear would open a Pandora’s Box of foreigners demanding more rights that ultimately could threaten Qatari control of their culture, society, and state. Wasting goodwill and the calling into question of the sincerity of Qatar’s declared intentions threatens however to deprive the Gulf state of the time and space it needs to enact reforms its critics were willing to grant it. Les pays du Golfe, dont Abou Dhabi où se tient le dernier Grand Prix de la saison ce week-end, ne veulent pas que le Qatar ait sa course ? L’émirat a une solution : racheter tout le barnum ! Au commencement tout n’était que poussière, désert, pétrole et gaz… Puis vint Bernie Ecclestone qui, des pistes du désert, fit naître le blé. Et l’harmonie régna… Enfin non, pas tout à fait, voire pas du tout. Car si Abou Dhabi, où se tient le dernier Grand Prix de Formule 1 de la saison ce week-end, sur l’île de Yas, a eu droit de cité depuis 2009, c’est que Bahreïn l’a bien voulu. En effet, Ecclestone, patron de Formula One Management, qui s’occupe des droits commerciaux de la poule aux œufs d’or, a consenti un droit particulier au royaume, lorsque, en 2004, il lui a octroyé un Grand Prix : celui de mettre un veto sur l’organisation de toute autre course dans la région du Golfe. Tant pis pour le Qatar, qui a pourtant annoncé être tout proche de décrocher son GP en début d’année : pour James Dorsey, chercheur sur le Moyen-Orient à l’université Nanyang de Singapour, «organiser un Grand Prix constitue une manière d’exercer un "soft power"», et aussi une façon de faire oublier les polémiques autour du Mondial 2022, «avec les interrogations sur le coût, les conditions de travail…» Mais à Sakhir en avril, lors du GP du Bahreïn, Ecclestone coupa court : «Je pense que nous avons assez de courses dans la région.» Une manière de dire que Manama avait réitéré son refus de voir un Grand Prix se dérouler au pays d’Al-Jezira. L’épreuve de Bahreïn constitue «le seul événement sportif international du royaume», selon James Dorsey, avec un apport touristique de 100 à 150 millions de dollars selon les organisateurs. En revanche, le Qatar est partout : foot bien sûr (PSG, Coupe du monde 2022), chaîne de télé BeIn Sports, hippisme (le Prix de l’Arc de Triomphe est ainsi devenu en 2008 le Qatar Prix de l’Arc de Triomphe), cyclisme (Tour du Qatar depuis 2002, partenariat de Qatar Airways avec le Tour de France en 2011), championnats du monde d’athlétisme en 2019… Les sports mécaniques n’ont pas été en reste, le circuit de Losail accueillant depuis 2004 le MotoGP avec une volonté de se démarquer, la course se déroulant en nocturne depuis 2009 - une singularité dans le championnat. Ce même circuit accueille jeudi et vendredi, toujours en nocturne, la dernière manche du championnat du monde WTCC (une compétition de voitures de tourisme dominée par Citroën). Discipline bien ancrée dans un Moyen-Orient disposant de son propre championnat depuis 1984, le rallye WRC est depuis quelques années le théâtre d’un affrontement entre le Qatar et Abou Dhabi… au niveau du sponsoring. Abou Dhabi a apporté de l’argent frais à l’équipe Ford en 2007 moyennant l’arrivée du cheikh pilote Khalid al-Qassimi dans l’équipe, le Qatar engage depuis 2012 sa propre équipe en faisant rouler des Citroën DS3, notamment pour le héros national Nasser al-Attiyah (double vainqueur du Dakar en 2011 et médaillé de bronze aux JO de 2012 en ball-trap). Le chassé-croisé va bon train avec, en point d’orgue, l’engagement du Qatar Investment Authority à hauteur de 17 % dans le groupe Volkswagen, ce qui lui coûtera des milliards après le scandale de la triche aux contrôles antipollution du groupe allemand. Et ce, dans une région où les tensions sont légion, y compris entre ces petits Etats. Les évolutions au Moyen-Orient ont créé des différends au sein des pays membres du Conseil de coopération du Golfe (Arabie Saoudite, Emirats arabes unis, Koweït, Qatar, Bahreïn et Oman), notamment en raison d’un fort clivage au sujet des Frères musulmans. Cette organisation, brièvement au pouvoir en Egypte après la révolution avec Mohamed Morsi et en Tunisie avec Ennahdha, a été fortement encouragée par le Qatar, alors que l’Arabie Saoudite (aujourd’hui soutien de l’Egypte du président Al-Sissi) lui est hostile. Au fond, il apparaît que ni Bahreïn, ni Abou Dhabi n’ont un véritable intérêt à voir débarquer Doha dans le barnum. Le Qatar est-il condamné à rester éternellement aux portes de la F1 ? Pas sûr. Car il est possible que Doha ait déjà trouvé le moyen de passer outre les petits arrangements de Manama avec Ecclestone, un moyen d’une simplicité biblique : racheter la Formule 1. Purement et simplement. En association avec la société RSE Ventures de l’Américain Stephen Ross, patron de la franchise de foot américain Miami Dolphins, l’Emirat s’intéresserait à Delta Topco (la compagnie qui gère les droits commerciaux de la F1) et de son actionnaire majoritaire, le fonds CVC. Son offre avoisinerait 8 milliards de dollars, selon le Financial Times. Si l’opération se réalisait, resterait alors une dernière case à cocher pour le Qatar : «Jeux olympiques». Le Britannique Lewis Hamilton (Mercedes) déjà sacré devant les Allemands Nico Rosberg (Mercedes) et Sebastian Vettel (Ferrari) ; Mercedes en tête du classement des constructeurs devant Ferrari et Williams-Mercedes… le GP de dimanche n’a plus grand-chose à offrir en matière d’incertitude sportive. Allez, en creusant un peu : la 4e place va se jouer entre les Finlandais Valtteri Bottas (Williams) et Kimi Räikkönen (Ferrari) et la 6e place reste à prendre pour les écuries, Lotus et Toro Rosso pouvant encore l’arracher.